North Korea may be one of just two non-Muslim majority nations impacted by the Supreme Court's ruling to uphold President Donald Trump's controversial travel ban, but there is little concern that the decision could negatively impact ongoing efforts to engage Pyongyang in talks over its nuclear program. The Court's 5-4 ruling on the travel ban, which restricts entry into the US from seven countries, including North Korea, comes as the administration continues its efforts to establish meaningful negotiations with Pyongyang in the wake of the President's summit with dictator Kim Jong Un earlier this month. While Tuesday's decision has sparked outrage from Democrats who argue the ban is both unconstitutional and discriminatory, there is little expectation within the administration and on Capitol Hill that it will hinder diplomatic talks with North Korea. According to the State Department, the decision will have little impact on a practical level, because North Korean travel to the United States was already severely limited before this ruling. And despite the ban's restrictions, a House Foreign Affairs Committee aide noted that North Korean officials could still be allowed to travel to the US on a case by case basis if they are granted a waiver similar to the one that allowed one of Kim's top advisers to visit the White House earlier this month. Democrats seem to agree with that assessment. "I don't know that the SCOTUS ruling has a whole lot of effect on talks with North Korea," a Democratic congressional aide told CNN, adding that there has only been one North Korean official to come to the US in recent months and that the ban includes fairly broad waivers for the President to exercise. "I'm not sure how much I would read into it," the aide said, despite admitting that the timing is "bizarre," given it comes just weeks after Trump's summit with Kim. "North Korea may choose to respond, but the travel ban has been in the works for a while," the aide noted. While Tuesday's decision may not have much practical significance in terms of preventing North Korean officials from entering the US, the time that has elapsed since September when the ban was issued and the court's ruling does reveal "how quickly the Trump administration has turned around on North Korea," according to Abraham Denmark, director of the Asia Program at the Wilson Center. "Just a few months ago, the entire country was seen as dangerous and suspect. Now the President and the Secretary of State claim that North Korea is no longer a threat and that we can trust Kim Jong Un," Denmark said. "North Korea hasn't changed -- the Trump administration has changed, and this is the ghost of strategies past returning to haunt current diplomatic efforts," he added. At the time when Trump issued the third version of his travel ban last September, the US and North Korea were engaged in a heated standoff. Trump and Kim engaged in a heated war of words for months, as North Korea continued its nuclear and missile tests. And while Trump insists that Kim has stopped its tests in recent months as a sign of good faith, North Korea has stated that it did so because its programs have reached a stage of development where tests are no longer needed. While tensions has cooled in recent months, there is still no evidence to suggest that Kim has begun the process of dismantling his test sites, despite Trump's claim that he promised to do so when the two met face-to-face -- a key concern for Democrats who say they are curious to see whether the administration's efforts have produced any real diplomatic momentum. 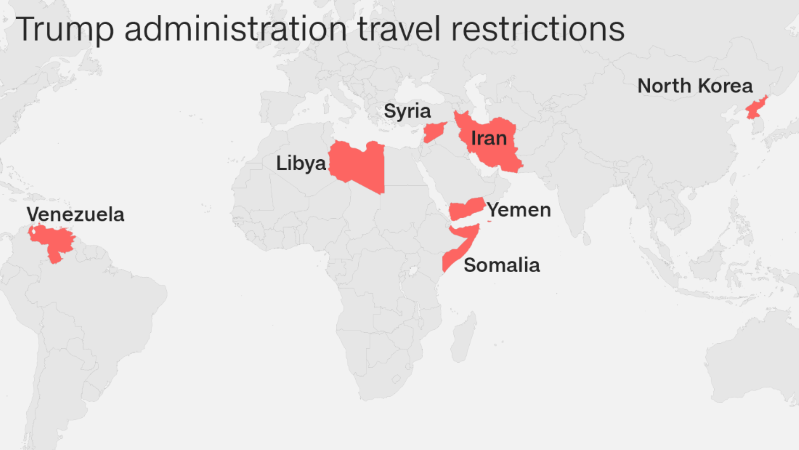 Last August, Trump administration banned US citizens from traveling to North Korea with exceptions for journalists and aid workers.